In Autumn last year, John from J Adler Shoes asked if I would review his bespoke shoes in return for a review. I don’t normally take up such offers, particularly for lower-end shoes such as these, but I was interested in Adler’s unusual fit process: sending plaster socks that you mould around your feet, and then return to them. That moulding process largely worked. You remove the socks from a plastic packing, rinse briefly in water, and then put onto your foot. The sock hardens after a few minutes, and you cut yourself out of it using scissors. You can see the process here. It’s not quite as easy as it looks – you can only rinse the sock for a few seconds, otherwise it starts to harden and won’t go onto the foot. I failed with sock, and had to ask John for another. Although the instructions could have been clearer on that point, the final result was a pretty satisfying set of moulds. Unfortunately, when the shoes arrived a few weeks later, the result was not good – in terms of fit, style or make. I don’t like writing negative reviews, but I feel in this case it is worth recording, given that one or two readers have asked for my thoughts on Adler. It also doesn’t seem transparent if a maker asks for a review, but it is only published if the conclusions are positive. Let’s start with the fit, given that’s the biggest argument for buying a service like this, and is the least subjective area. Unfortunately, the shoes were too big pretty much everywhere. With both laced as tightly as possible, the back halves of my feet rattled around. There was too much room above the joints as well, causing the leather to buckle. The arch support was very pronounced, but that didn’t help fill the shoe. And overall it was pitched forward, rather oddly, with a wedge section in the heel. The quality of the make was also not great, particularly for this price point (£440). The leather was thin and polished poorly. John assured me there was the normal reinforcement in the heel and toe, but I couldn’t feel it: the toe was soft and unstructured and the top of the heel cup collapsed easily. The heel and sole were almost brutally large and chunky – though this is arguably more of a style point. Moving onto style (which is obviously the most subjective area), it’s hard to think of anything I liked. The toe shape was rounder and bulkier than anything I’ve seen outside working boots. The ‘antique’ finish I chose appears cheap and synthetic. The heel and sole, as mentioned, lacked any style. This all sounds rather harsh, but I also think it’s fair. I have communicated my thoughts to John, who offered to make me another pair – but given how far off the fit was, it seems impossible I would ever be able to recommend this service to readers. I emphasise again that this is just one experience, and I have been told others are more positive. But given how far this was from the quality normally discussed on this blog, I don’t feel I can recommend them in any way. You can follow the discussion on J Adler bespoke shoes: review by entering your email address in the box below. You will then receive an email every time a new comment is added. These will also contain a link to a page where you can stop the alerts, and remove all of your related data from the site. The word “hideous” springs to mind. To paraphrase you on the working boots: I’ve seen working boots more elegant and stylish than these lumps. The styling of the shoes keeps a discerning buyer away, but it’s sad to know that the innovative process of taking measures does not work. I dont know if I am more surprised about how bad they look or that the company who have seen your blog and the other shoes that you’ve reviewed would actually send you these. Simon, ‘bespoke’ at £440 seems a contradiction in terms. Cleverley would be, what, £3500 approximately? Although it’s not to my taste, I don’t wish to make any criticisms of the shoes design or, indeed, the quality that you’ve described. I take my hat off to anyone who has the skills to make a pair of shoes. I’m only curious to know, what differentiates these (described as bespoke at this price) from a Cleverley or G&G which costs 7 times the price? Savile Row, likewise, has a lot of highly dubious companies who offer ‘bespoke’ at a fraction of the normal cost. I disagree that it’s upsetting that the ‘plaster socks’ system doesn’t work (or for that matter eletronic scanning). When you buy bespoke shoes part of what you pay for is the interpretation by the maker of your foot measurements and his experience in how best to marry this with your choice of style. This experience is reflected in the cost – making great bespoke shoes shouldn’t be easy; it is a collaboration between maker, client and house styling, a creative process not a mathematical process. Read this with interest, however my experience with Adler was the complete opposite. Dear Simon, actually to all three. I had ordered their Londoner Brogue and later a Cap-Toe Oxford, both were a snug fit when new and are really comfortabe now. I also have to say that I love the leather, although I did not order the antique version. My toe-caps are firm as they should be and so is the heel, if not as hard as in some of my other shoes, a fact that I actually prefere. Mine came with a nicely pointed toe-cap. I took my first pair to my cobbler who used to make bespoke shoes but is now semi retired and he was delighted with the workmanship of the shoes. My experience with Adler was all positive. The honesty of the review is encouraging and hopefully the company will no doubt learn from this. At which point let’s hope you are able to re-review. One question I would ask is , what alternative would u recommend for at the same price level ? Thanks for a great site as always Simon. Simon, I thought you lost your way a bit on this post. You have always been very good at focusing on what interests you, and a Permanent Style DNA has arisen out of that. Unfortunately, the product featured here is hardly a match. You may have a soft spot for novel ways of fitting and measuring for shoes, but come on, why would you want to replace a shoemaker when he puts measure and pen to paper – especially when the results are so spectacular (ie. any of the bespoke makers you have written about). I can see your point C. I think most readers would be interested in a new way of creating bespoke shoes though, and would like to see whether it works or not. I agree it’s not something I would ever buy myself at this stage, but most readers are often looking at cheaper options. C., while these shoes deserve criticism, I don’t think it is fair to criticise Simon for writing about them. His honesty, experience and traditional mindset make this a very valuable review. This post is very relevant to this blog. Simon writes about the great benefits of bespoke, and I think it is just as relevant to see examples of how to avoid bad bespoke. Simon influences people to use bespoke services, but many people cannot afford the best bespoke. This post shows that less expensive is not always worth it and how traditional options are often the best. Thanks for your comment. Now the question worth asking is whether Adler could learn from such a review and drastically improve the quality of their shoes. Thanks for this review, Simon. Frankly, at this price point I would rather go for even a decent benchmade at a lower price. You haven’t mentioned the quality of the leather for the uppers and the lining. But from the pics, it seems to be of a lower grade than the one normally used even by lower end Northampton shoemakers. Think of, say, Loake 1880 line made with leathers whose quality rivals the one to be found in middle range shoes. And leather grade, as readers of this blog know, is in itself a crucial criterion in buying a pair of shoes. 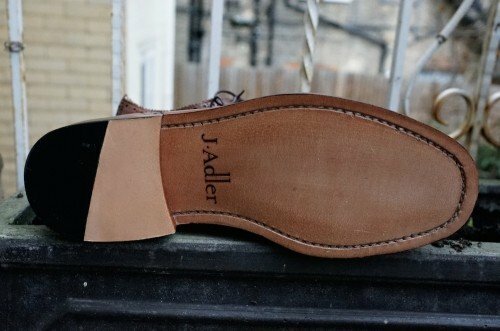 In the price range of C&J handgrade but with lesser elegance than Jones Bootmaker; unfortunately J.Alder clearly do not have a clear understanding of the competition within the price point that they are targetting. A worthy article demonstrating if nothing else that elegant design and quality shoe construction is reserved to only a few well established brands and that this pretender is not going to cause the competition any sleepless nights. I was just about to order another pair of Adler shoes and was surprised to come across this review. My first surprise was how google had found and indexed this article in less than 6 hours. More surprising was how different your experience has been to my own. The type of shoe you chose is not to my taste so I won’t comment much on style. The heel is much more of a wedge than any of the styles I have chosen. I ordered my first pair of shoes from J Adler just over two years ago. John was very helpful throughout the process and I used a casting method with wet bandages. The process was simple and although it was a bit fiddly to wrap the bandages uniformly around my feet I ended up with what I thought was a good cast. My first pair of shoes arrived after a couple of months and were a perfect fit. I chose a soft brown leather and got exactly what I asked for. My feet were snug in the shoe and there was definitely no slipping. I was happy enough to to order a second pair. The second pair were a hard black leather dress shoe made from the same last. They arrived 3 weeks later and once again were a perfect fit. They felt so similar that I tried a shoe on from each pair and they were felt identical. I ordered a pair of black shoes with a very soft leather next and once again they arrived 3 weeks atfer order and the fit was perfect. A year passed and the shoes began to feel a little large on my feet and were slipping a little. An insole improved the fit but I decided it was time to order some new pairs. I had lost a significant amount of weight over the year and wondered if the my feet had changed size and shape as a result of the weight loss. I contacted John and he thought it best if I re-cast my feet again. The casting method had changed to use the “wet sock”. It was far easier and quicker then the bandage method. Once again the instructions were clear and the results were good. The first new pair of shoes arrived and once again the fit was perfect and the quality exactly as before. Your review mentions the heel cup collapsed easily. The photos of your shoes do seem to make the heel look less substantial than the shoes I am currently wearing so I wonder if the choice of style and leather have contributed significantly to your dissappointment in the shoes. I thought I would have to travel hundreds of miles and spend many hours to get a pair of shoes made for me. The J Adler process has enabled me to have shoes made that fit perfectly and saved me a lot of time and effort. I have and would recommend the process, company and product. Simon, what we need now is for you to try Lanvin’s and Jeff Banks’ ‘bespoke’ suits in Savile Row! Would love to see that. Jokes aside, this article demonstrates the difficulties that true bespoke craftsmen face when low-quality suits, shirts, shoes, etc, are sold by others to the unsuspecting public as ‘bespoke’. It’s hugely damaging to these small industries. Well you know what they say in retail: there’s no such thing as bad publicity. At least this site will drive more traffic to Adler than a few adwords. However I have nothing positive to say about these shoes. They are inelegant from every angle. I tend to buy Edward Green in the sales for that sort of money and they are simply beautiful. The quality of the leather hardly bears comparison. Mind you I’m not sure I get bespoke shoes. I can’t imagine how I could improve on the fit of EG’s Dover 606 last in an E fitting. I can appreciate the tight waist in Simon’s G&G / Bemer shoes but I couldn’t justify the additional expense. You didn’t actually need to say too much. The pictures show the quality of the shoes. That’s too bad. A quick look at their very unprofessional website (who the hell uses stock photos to advertise a personalised, bespoke and handmade product?) and their current ‘collection’ (or the list of styles you can choose which holds beauties like ‘designer loafers’) makes you want to take a big step backwards and go look elsewhere. I’m surprised that you even took up the offer to try this Simon. I wouldn’t be surprised if they use the ‘sock’ lasts to simply measure your size and maybe width and pick something suitable from an RTW supply. Isn’t £500 close to what you pay when dealing with the less known Warsaw / Polish shoe makers? That was painful. Truly sad. I suspect John at J.Adler was hoping for some praise, even if it were the tiniest crumb. There are so many people who sincerely believe their creation is “just as good,” or even better than those well respected for their style and craftsmanship. Apart from rustic finish, shoes appear to be corrective footwear for club feet. I can’t imagine that a heel-to-toe fit is comfortable. Simon, great review due to its honesty and journalistic concentration on the truth, something that is all too rare in fashion journalism. Timely also, as with others I have given Adler some consideration. Should the opportuniy arise could a review of Laszlo Vass be done. The price of bespoke including airfares to Budapest probably beats many other offerings. Lastly, as Doug points out his experience is very different. It might be unfair perhaps but would you give Adler a second chance with another style (even on a bad day, after a night of heinous imbibing, I can`t see you wearing this style for the purpose of pleasure). Thanks again for the article, its why you and this sight are beyond any competition. thank you for your honest review. As I saw the picture of the shoes I was not sure, if I am on the right homepage. The shape is really more like a working boot…and does not look like the shoes you normally wear. The shoes look pretty awful. But are they any worse than that Kiton jacket you had made? You seemed less critical of that company-I hope not just because it is a bigger name? At first I would like to thank the Author for letting me respond to his review of our product. To make it as short as possible, I would like to respond to the three main issues in the report. The fit – we have in general a 99% success rate on the first last. Our service (as we clearly say on our website) includes that if there is a fit problem, we will discuss this with the customer and either make some changes in the existing shoes or make a new pair, having made changes to the customers last. The Author refused this outright which means he has not really used our service and therefor the criticism of the fit or the final outcome cannot be accepted as a fact relating to our product or service. We make the last according to the cast we receive. We also ask the customer not to wear any socks and to do the casting at noon, which is important since some customers feet tend to swell later in the day. Why there was a fit problem in this case is unknown since he did not give us the chance to correct this. The Leather – The Author asked for the shoes to be made in our “antique leather”. This leather is not “antiqued’ which means artificially painted to make it look as if it has developed a patina, but it is classic “antique”, meaning a vegetable dye in an process that is not done generally anymore, but especially for us by a small tannery. This leather is unique since each shoe is unique in shading. We do say that this leather will develop a beautiful patina in a short time, having been polished a number of times. There is nothing artificial about it, rather the opposite. The leather is hand-oiled before the shoes are shipped, but is “very hungry” due to the tanning process and will change significantly over a short period of time and cream/polish applications. The style – The particular model the Author has chosen is that of a rustic, strong Gentleman’s Brogue made in the Goodyear welt method by hand, not with a Blake stitch. Not wanting to offend the Author, but the photos are made from an angle and in a way that would make an Italian designer shoe look chunky. The selection on our site ranges from classic to Italian style designer shoes and he could have picked anyone. 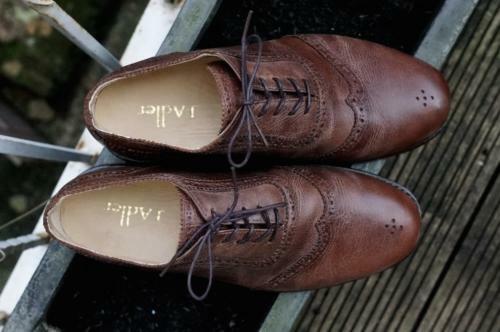 Bespoke means literally “talked about, discussed” – to start with, our shoes are fully handmade. The upper leather is stitched by hand on sewing machines, not with a needle and thread. The leather is cut by hand and Brogue holes and other decorations are punched by hand. The lasting and the “marriage”, the actual construction of the shoe, may it be in a Goodyear welt or Blake welt is done 100% by hand with traditional cobbler’s tools. The customers selects a model of his choice, in a leather and colour of his choice. He generates the casts and we proceed to make his personal last which is shaped exactly to hi foot and the style of the model. There is always a compromise involved since style sometimes has to step back to allow for comfort to take the prominent role. Our designers than make the templates to the particular model by hand and those are used to cut the leather by hand. Finally, if there is a fit problem, which is quite rare, it is discussed with the customers and we usually ask for a couple of pictures in addition by email of his feet next to the shoes. As said before, if the problem cannot be fixed on the shoes he already has, we make appropriate changes to his last and re-make the shoes to a perfect fit. This is what I would call bespoke. If there is a fit problem, one could look at it as the first pair being a trial pair, as is done by some famous makers who will charge GBP 4,000.00 and not GBP 390.00 for a pair of bespoke shoes. I do understand that offering bespoke shoes at such a low price is a “fly in the ointment” of some of the substantially more expensive makers, but thousands of customer over the years have become regulars and our customer base is growing fast. Simon, in J Adler’s response they describe their shoes, whether Goodyear or Blake construction, as ‘100% by hand’. Goodyear means by machine. It is the exact opposite of a normal hand-welted bespoke construction. If a machine is operated by a person, that does not make it ‘by hand’. This is becoming a farce. For most consumers, bespoke enables a degree of accuracy and attention to detail that is not possible to achieve elsewhere. The response from J. Adler has so many spelling mistakes and grammatical errors that I would question the company’s thoroughness in production. I appreciate not everyone can be a linguist, or may have other difficulties with written language, but I would have thought that having been given the opportunity to respond to the original article, a bit more care would have been put into the reply. I would like to ask about your opinion on keeping one’s bespoke (or even MTM) suit jacket’s sleeve button unbuttoned. Do you personally do it? Or do you think it is too much of showing off? The shoes look like Samuel Windsors which you only get online..same sort of sole and heel and cheaper by far.love your reviews . They look like a pair old potatoes ! Simon kind of unrelated question but do you get calluses on your feet…if so, does that mean that the bespoke shoe that has been made for you is not a perfect fit? Adler aside, is there any update on your Caraceni? I’m just wondering…if J. Adler shoe are not “bespoke” then what is the definition of bespoke? I thought bespoke meant custom made. I know they aren’t selling standard sizes (my size shoes can’t be found in most stores). So if they are making the shoes to my style specifications and my exact foot measurements, isn’t that “bespoke”? Meaning is use, as Wittgenstein almost said. Great post, thanks. Mainly because as you already say these shoes (and the response to them) simply demonstrate the esoteric qualities of bespoke – although it will likely only be understood by a small number of people, every man or woman is free to include him/herself in this group, making such divisions rather arbitrary. The funny thing is though that most people here seem united in dislike, which means there is a definition of bespoke most readers share, albeit consisting of an almost metaphysical agreement that can’t be put into words. It’s very democratic of you to include the man’s counterargument which, unfortunately, sounds like a rebuttal and as such only proves the point you initially made about having reservations concerning such offers. Besides, in my opinion his arguments are beside the point: the leather being a unique vegetable dye doesn’t mean they can’t look cheap and synthetic at the same time, and complaining about the angle of the photos is laughable really – you always rightly say photos can’t do bespoke clothing justice, but most of the time everyone here notices the beauty and craftsmanship nonetheless. I still can’t explain to some friends of mine that bright stitching on the lapels looks cheap, the same as I don’t like bright red buttons and double-collared shirts, but I’ve given up telling them this. If they’re happy I’m happy. 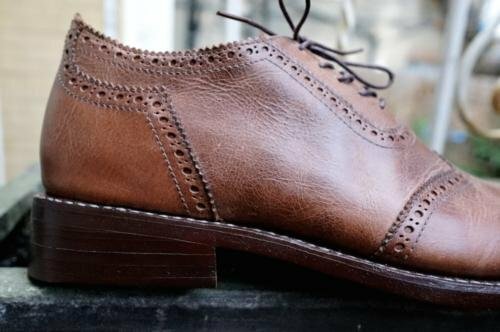 Finally, saying cheap bespoke shoes are a fly in the ointment of more expensive makers is outright nonsense – I daresay they’re actually thrilled with such shoes (and an honest review like this), because they prove to be everything the ‘famous’ makers are not and help to preserve the sharp distinction bespoke makers are actually proud of. One such thing setting bespoke makers apart happens to be not showing off with your growing fan base. It would have been more honourable in my opinion if he’d have borne his loss stoically. I am sorry if this sounds a bit harsh, but if every lesser artisan would have his say here we’d get into a circular argument leading away from the wisdom there is to be found in true bespoke, something you lay bare for us. Every man must decide for himself if he sees this or not. Thanks anyway Simon for proving your point in a subtle way. http://jadler.com/uk/796-thickbox_default/the-chelsea.jpg . From this image, the level of sophistication – or rather, lack thereof – is painfully evident. Frankly, the shoes look like the first work of an aspiring shoemaker, not like a product ready for the market. But also, of course, because the words “Italian designer shoes” used as something positive indicates a fundamental lack of understanding for what Permanent Style is all about. Misconceptions like ‘Bespoke means literally “talked about, discussed”‘ add to my feeling that J Adler are ignorant, on several levels. You go simon! Great post. Simon, in fairness to Adler I think it only right that you might address the issue of denying a revised fitting as outlined in Adlers’ response (para 3). Other respondents advise they took this path for a satisfying outcome. If you denied the offer of service are you not also denying the true benefit of bespoke, that is working with the manufacturer until it is correct, a path you have taken many times, as with Gieves (boots which failed on the first try)? As this might adversely affect Adler I think it only fair to advise readers why this path was not followed especially as Adler will got to the lengths of making another pair if satisfaction is not found with the original. I originally praised the article for its honesty but, respectfully, I do feel Adler’s point now needs to be addressed. Thanks Stephen, i take your point. Im happy for them to make me another pair if they want – bit im sure you can understand my pessimism. They may well fit better, but its highly unlikely they will be good enough to rival other bespoke services discussed here. The service is also very different to Grenson and other bespoke services – Adler will not see my shoes on me, they will have no way to assess what is wrong other than my description. It will merely be a second guess. …sorry re. boots in above comment…that should read Grenson not Gieve! The only note of balance I might try to add, is that many a time, bespoke commissions can simply go wrong. This can happen with even the supposed ‘best’ artisans and makers in the world. One only has to look on the user discussion forums of bespoke tailoring (doesn’t seem to matter if it’s savile row or high neopolitan) to see the pictures posted, where the end garment looks no better than an off the peg garment from marks and spencer : I.e. A waste of time and money. A lot of users on here seem to be conflating price with perfection in bespoke: “expensive inevitably equals better” – I would bet my bottom dollar that there have been many a bespoke pair of bench made bespoke Northampton made super priced shoes which simply did not turn out to plan. You may hear about these less because the owners are embarrassed to admit they wasted 2k on shoes which don’t look nice. So I don’t think it’s fair for commenters to unilaterally trash this particular maker. Wiser perhaps to just write them off as “not to my taste” and understand that sometimes mistakes and misinterpretations happen across all levels of bespoke, it’s really the maker’s attitude to correcting their mistake which is most important. If they start arguing and refusing to acknowledge their mistake – THAT is the time when they can reasonably be publicly trashed (if one so wishes). Simon, some of your readers may remember your recent post about production costs for bespoke suits. The same principles can be applied to the shoes above. The best tailors and shoemakers use the oldest, most labour-intensive ways of making things. The best bespoke shoemakers, as you know, use beautiful leathers from the best tanneries in Europe. It’s expensive. The leather that is used on the soles alone takes 1 year to tan and it goes through a ridiculous number of procedures, such as burying in the ground with oak bark, hammering and oiling, etc. They use the best craftsmen (who’ve spent years learning their skills) to make the shoes. Stitching, colouring, sanding, etc, by hand is done this way because it allows more control over many things and better quality. The normal bespoke fitting process alone is time-consuming and involves making laborious and often expensive changes. I have no criticisms to make of J Adler, so long as they do not claim to give you e.g. Cleverley quality at a lower price. I think Made to Measure would be a fairer description of their shoes. Their own definition of ‘bespoke’ above was laughable. It’s important that they market themselves in an open and honest way and stop claiming that their shoes are ‘Goodyear-welted 100% by hand’. That’s an oxymoron if ever I heard one. Thanks Paul, I agree. Although on this experience I would have had a far better make and better fit from spending some time at Crocketts picking a good last and width – for the same price. (Crocketts would also have had higher costs – in providing that shop and the helpful staff). I have been thinking of ordering from them for 2 reasons: First, I can not afford £2000 for shoes + airfare to their shop to be measured and fitted which is what is takes from the very high end companies. £600-£700 is much easier on my wallet. And I am so busy, that buying bespoke shoes online seems like a dream to me. Just my opinion though. I have not ordered yet, but I will report back on my experience if and when I do, maybe Simon was just unlucky. I haven’t met any business yet that was 100% perfect on the first try of anything they made. I guess I’m just really wanting them to be my answer to my shoe problems. Does anyone else have any experience with this company? One thing worth emphasising – the choice is not just between this version of bespoke and the top end. Made to order from many companies, with the ability to pick any width and any size, perhaps different for each foot, in any last, would get you a much better fit than this. Also, there is the option for an altered last (eg from Saint Crispin’s) and once you have a bespoke last, for Goodyear make on that last, as I have had at Stefano Bemer for example. Simon, I think you’ve demonstrated quite clearly that genuine bespoke can not be done cheaply. Thankyou! You’ve also outlined some great cheaper alternatives for those who can’t pay top-end bespoke prices. Simon, I really hope you aren’t jumping to conclusions by assuming “Adler will not see my shoes on me, they will have no way to assess what is wrong other than my description. It will merely be a second guess.” Is this truly their method? Written or verbal description? With today’s technology, I can think of quite a few ways they could get an image of the problem via internet. If it were me, I would either request pictures, offer a Skype conference, request written measurements, or simply re-do the cast…is he really wanting to remake your shoes based off your general description of “too big”? I wouldn’t fault them for calling the first shipment the “fitting” and then following up in one of the ways mentioned above. Also, I’d really like to hear more from people who have actually made purchases from them. Maybe more than one opinion of a service is needed before judging? Surely not every pair they make result in shoes like this or they wouldn’t be in business. I agree, this is just one experience and i’d like to hear more. Although others wont necessarily have as much experience of other makers or knowledge of quality construction. what are the price points for st crispins simon? rtw and altered last? On a completely different note; have you got any idea where I can find a good quality traditional Guernsey sweater? Who are the makers to look for? I have hammer toes. I have spent a ton of money flying around the world to get fitted only to find that no one ever got it right on the first try. It can’t be an issue with every company I try unless the real issue is my feet. I think I’d give it a try. A nice comfortable pair of shoes designed just for me that can be ordered from the comfort of my couch….sounds nice enough to gamble a small amount of money on. Thanks for that Kenneth, nice to have some balance. I can see from the images that the shoes are made just as badly as the ones I received though. And although obviously subjective, I’d say the last and toe shape are equally poor too. Did the representative from Adler offend you in some way Simon? I sense the disdain you feel for the brand goes beyond the product. Simon, one question, are you actually a cobbler? So you are not a shoemaker, have not made a single shoe, all you know is from watching someone else maing shoes, hmmmmm your photographic skills are not exactly on par either it seems, since the first picture has been distorted when compared to the top-down shot, the first picture is reduced in width, making the shoe appear stockier. I assume that was by error and not on purpose? If you think having made a shoe is more important than my experience in the industry, I don’t think you understand it very well I’m afraid. I spent two hours having my feet measured in great detail by a very well known Northamptonshire shoemaker at their factory. Six weeks later and £700 lighter I was delivered a pair of perfectly formed but comically undersized shoes. I’d been planning to wear them to the opera that evening. I was refunded all my monies and received profuse apologies but I had invested nearly a whole day of my time for no result. I think that this game is best played at either the top quality RTW level or full bespoke. It would be sick if you wore them to Pitti. Shoes doesn’t really look like +£400! I have just ordered and received a pair of Ladies Black Kiltie shoes from Adler I have tried them on and wore them for about 5 hours they seem comfortable and are a good fit. All normal shelf bought shoes from shops have been tight and uncomfortable although I have always purchased the correct size and width. As the shoes from Adler were made to measurement taken by my husband I found they are just right in width and plenty of room for my toes to move. I cannot afford to pay £3000 a pair for shoes, so the shoes from Adler also fit my price range perhaps Simon when reviewing items you should remember to include the middle range of goods to the lesser wealthy of the country. Thanks EB. 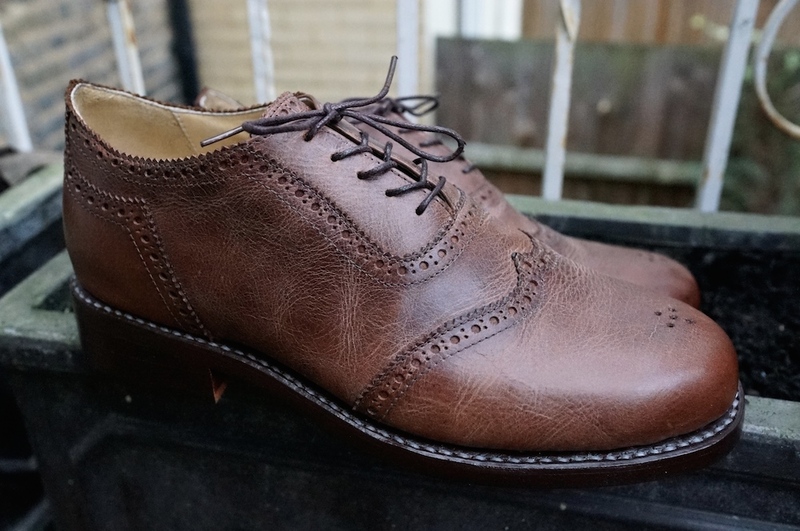 I have written many times about the mid-range shoes – particularly Northampton makers from Barker up to Edward Green (so £200 to £900). Unless you have particularly odd feet, some time spent with these companies looking at sizes and widths, and perhaps a special order, would be a good fit and much better make. My wife recently bought me a voucher from the J Adler site and I ordered a pair of Derby shoes after completing the moulding process. Yesterday the shoes finally arrived. I can honestly say that it is the worst £400 ever spent. The shoes are hideous; they’re at least an inch too long, they look cheap, the toes of each shoe have a very obvious bulge where the toe lining sits, the shape of the front of each shoe makes them look like orthopaedic shoes, and the curve/cut of the front is all wrong. When on my feet they make my feet appear to be curving outwards. They are absolutely awful. I will be contacting J Adler later today to ask for a refund., though I doubt if one will be forthcoming. I wish I had read your review earlier! He got me to spend £45 sending them back to Germany DHL then hasn’t issued the refund! It turns out (according to Mr Adler himself) that there is no J Adler Limited in the UK and he has been conned himself and the website shut! All in all BEWARE of J Adler because believe or not they are still taking orders on a different website!!! I just got a new pair of Adler shoes and they actually look and feel pretty good. I have a lot of trouble getting a correct fit and this seems to be quite good. The leather is also better than I feared might be the case. When I went to their web site it is no longer available. But, my shoes still came. For the price they appear to be quite good.